You voted and the ballots are in. 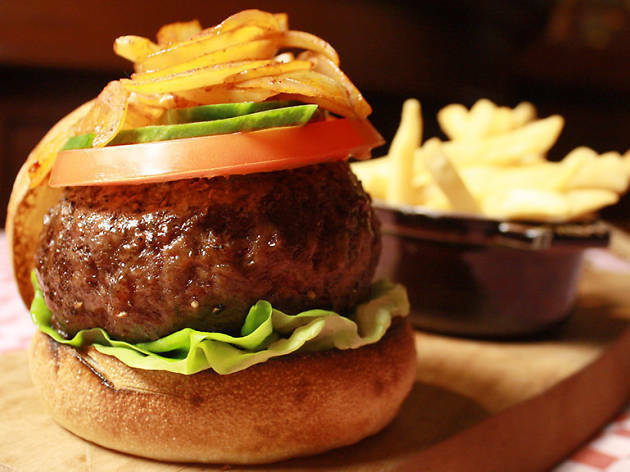 Meet the top 20 patties in town, decided by the most discerning burger lovers around: you guys! 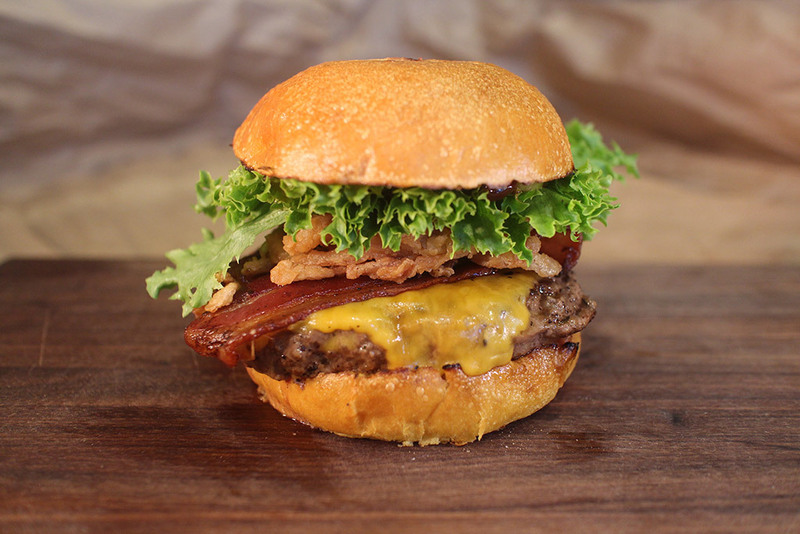 A little more than a month ago, we announced your meaty contenders for Battle of the Burger 2015. 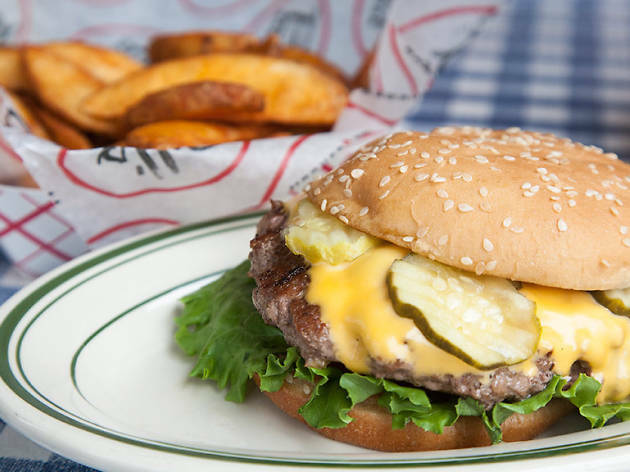 Now we present the top 20 patties in town, from diner-inspired cheeseburgers (Burger Joint) to tried-and-true classics (Minetta Tavern), decided by the critics that matter most: our readers! 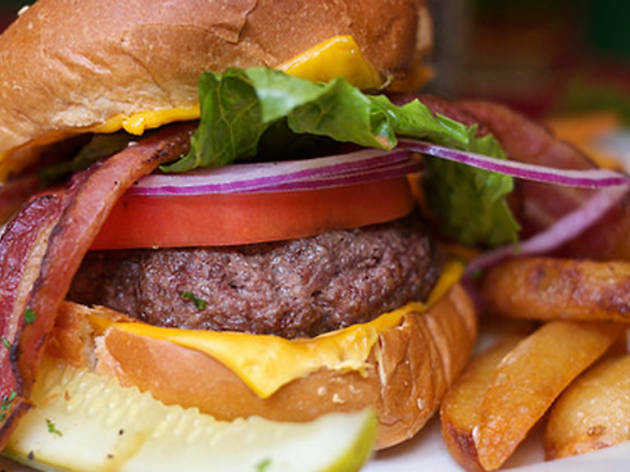 Check out these mouthwatering burgers and see if your choice made the top of our list. 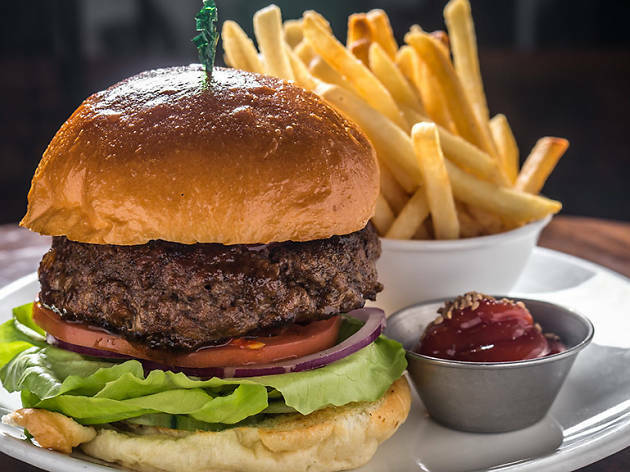 Local loyalists can argue over the supposed sacrilege of the uptown mainstay’s recent downtown expansion all they want, but there’s one thing you simply can’t argue: Whichever location you frequent, the burgers are first-rate. 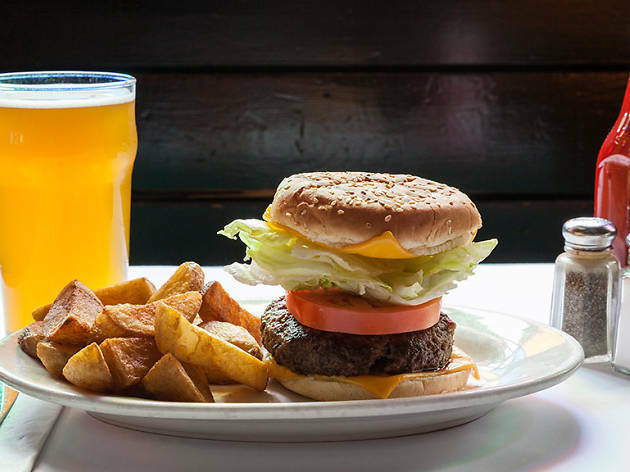 Since 1972, the UES tavern has issued its half-pound marvels, served superbly juicy and open-faced with rings of red onion and crinkle-cut pickle chips, across green-checkered tabletops. 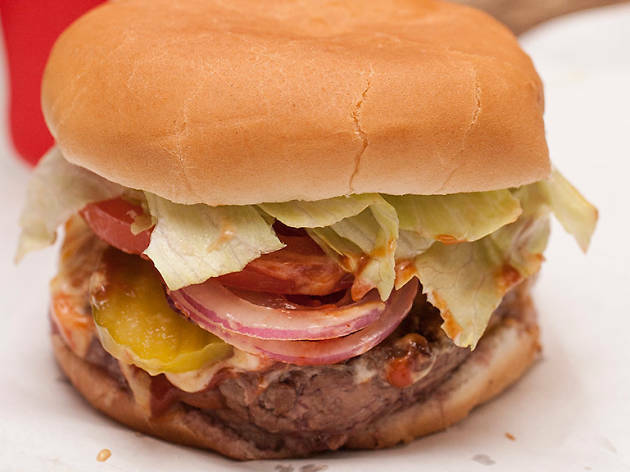 A curlicue tangle of bacon, cooked to a crisp in the broiler, is technically optional (for 45 cents more), but real burger lovers know it’s straight-up mandatory. 1291 Third Ave (212-744-0585). $11.50. 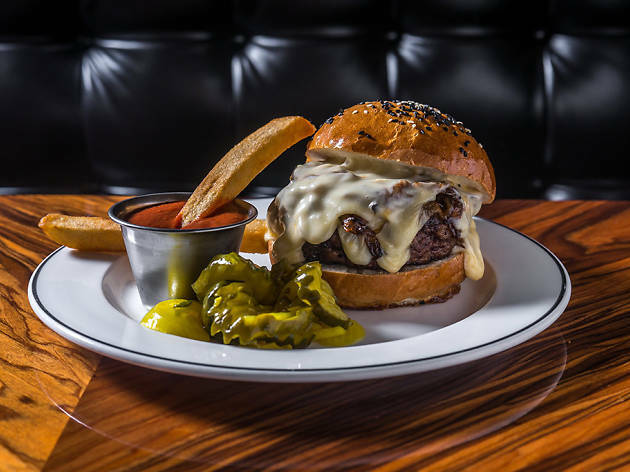 We’re comfortable saying New York beats Los Angeles in most things (sorry, not sorry), but even Big Apple burger purists welcomed Adam Fleischman’s Cali-bred umami temple with lengthy lines upon its 2013 NYC debut. 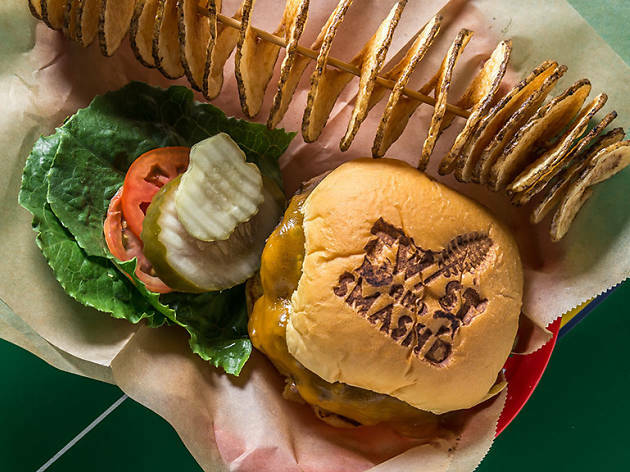 And it’s not hard to see why: The six-ounce, house-chopped patty is blitzed with umami flavor (the hard-to-describe “fifth taste,” after sweet, sour, salty and bitter), courtesy of stewy roasted tomatoes, shiitake mushrooms, caramelized onions and a crispy Parmesan wafer. 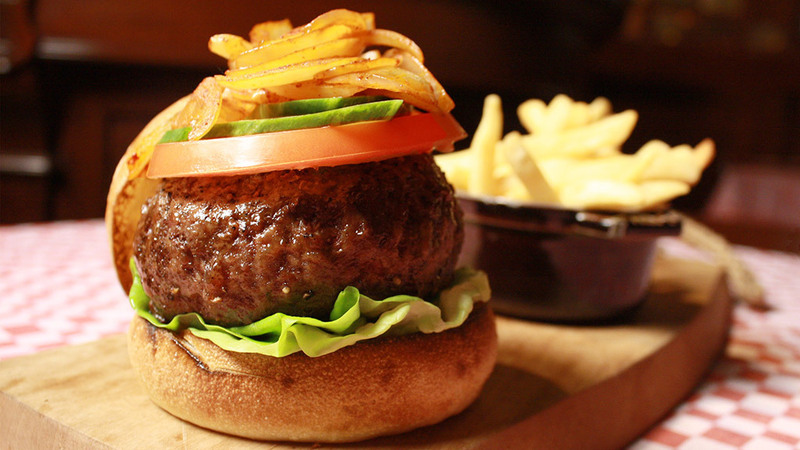 Lusciously rich and downright sensuous, it is the kind of burger you want to be alone with. 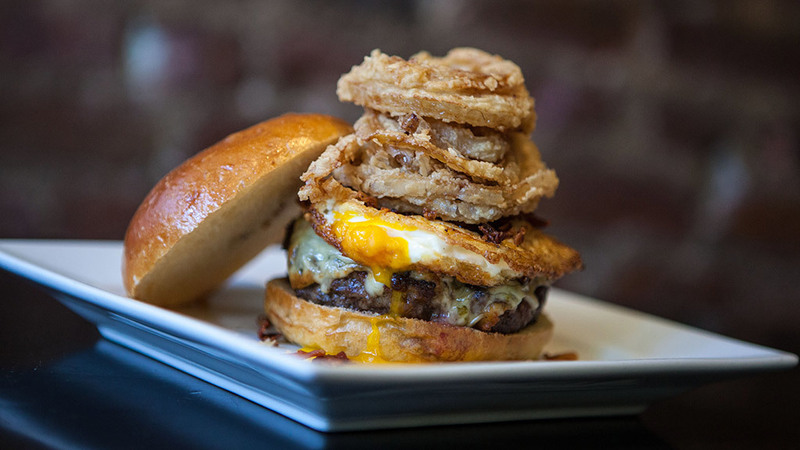 Various locations (umamiburger.com). $11.50. 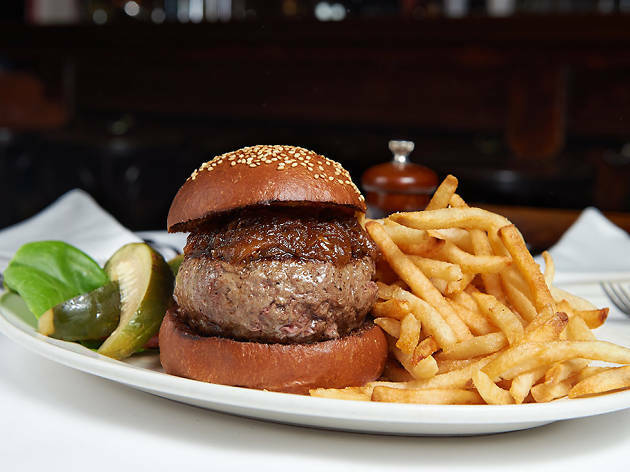 It’s hard to believe there was ever a time when burgers weren’t on the menu at Minetta Tavern. They were introduced to the nearly eight-decades-old dining room with the Keith McNally–led reboot in 2009 and have been synonymous with the joint ever since. 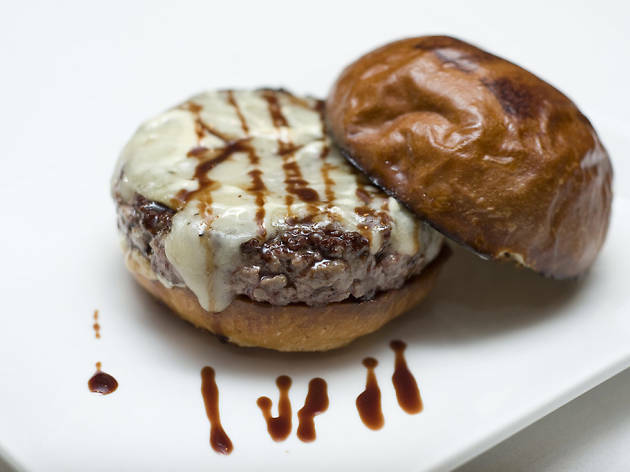 Fittingly, Minetta’s take is an exercise in Old World simplicity—there isn’t even cheese on the thing. Instead, it’s a hefty nine-ounce puck of mineral-funked beefiness, bathed in clarified butter and seared like a steak for less than five minutes. 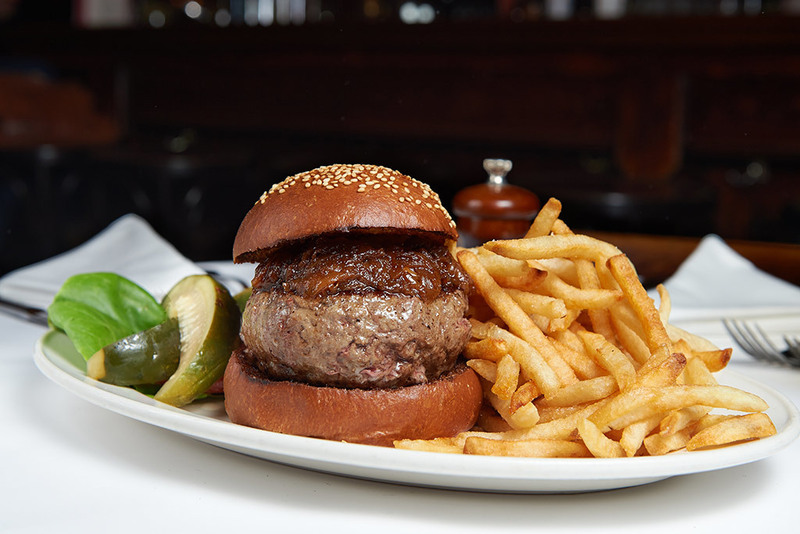 Only a swath of silky caramelized onions joins the patty on the custom Balthazar seeded bun, because when the meat’s this good, you don’t need anything else. 113 MacDougal St (212-475-3850, minettatavernny.com). $28. 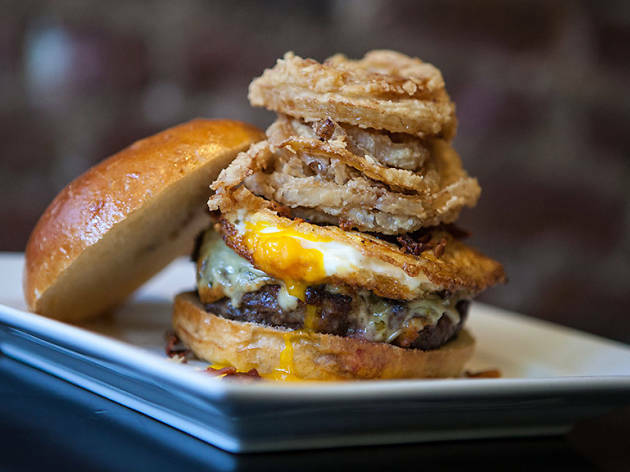 Okay, so the cat’s out of the bag for Marc Forgione’s off-menu burger: At 1:20pm each afternoon, the sleek Tribeca steakhouse tweets out the day’s available quantity of burgers—sometimes 10, a dozen if the team’s feeling generous. (It’s first come, first served and only available at the bar.) 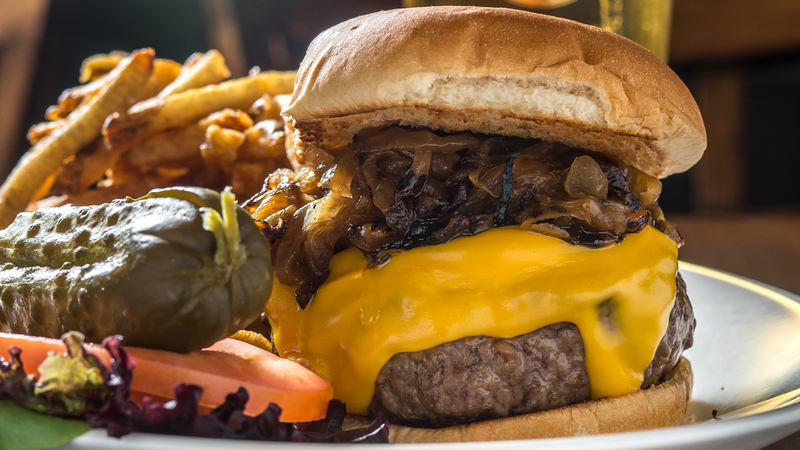 You’ll understand what the fuss is about when you nab one, with a melt-upon-contact blend of prime brisket, short rib and dry-aged rib eye loaded on a soft-but-sturdy house-made bun with bourbon-sloshed caramelized onions and beer cheese laced with cheddar, fontina and Brooklyn lager. 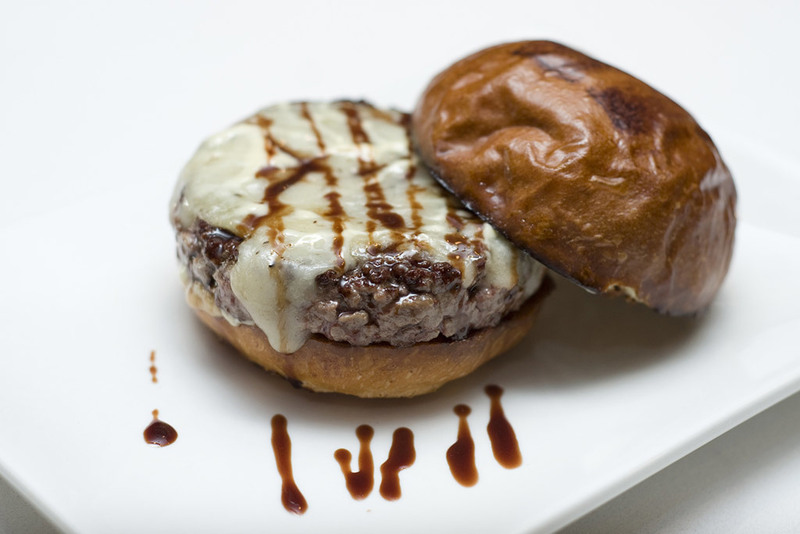 363 Greenwich St (212-226-4736, americancutsteakhouse.com). $21. 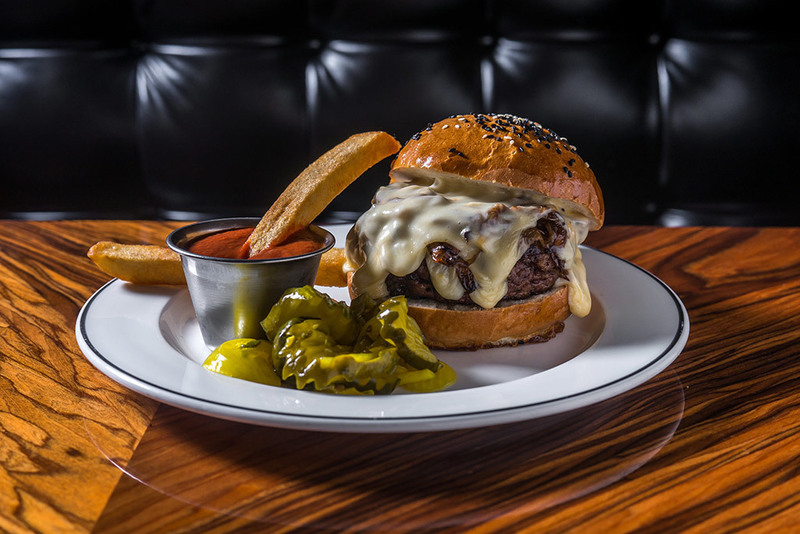 Meet one of NYC’s worst-kept secrets: The cultish patty slinger “hidden” behind floor-to-ceiling curtains in the lobby of Le Parker Meridien hotel—there’s a second less clandestine location in the West Village—is home to one of New York’s most mouthwatering burgers. Keeping with the junky, faux-retro diner digs, the five-ounce cheeseburger smacks of fast food (a squishy, humble Arnold bun; generous squirts of Hellmann’s and Heinz) but features upgraded ingredients: A hunk of Nebraska-sourced house-ground beef shoulder comes smothered with mild Colby and white cheddar cheeses plus a mess of textbook toppings (lettuce, tomato, onion, pickle). Various locations (burgerjointny.com). $8.96. Despite the name and FiDi location, this expansive dining room has none of the raucous beer-slinging madness of nearby bro-attracting spots. High ceilings, soft music and a crowd of midday suits keep things tame, and this Angus beaut is similarly composed—lightly seasoned, lean patties start off on the flame grill and are finished off in the broiler. 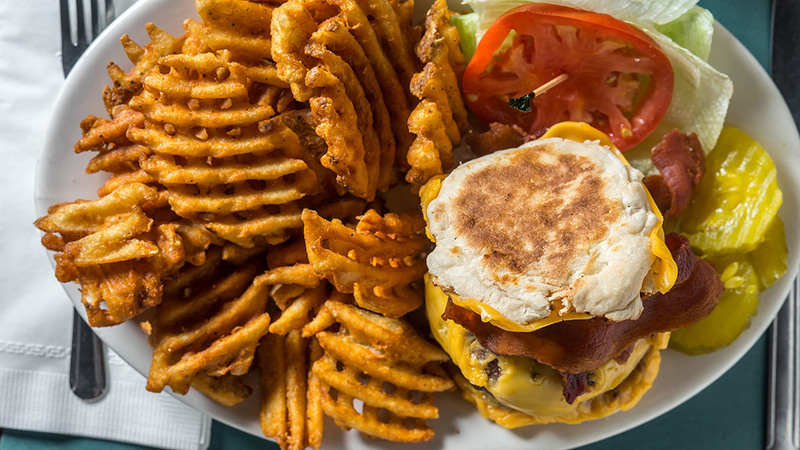 Sweet Hawaiian buns cradle the juicy meat, with hand-cut fries or a salad to round out the platter. 110 John St (opendoornyc.com). $12. If it ain’t broke, don’t fix it. 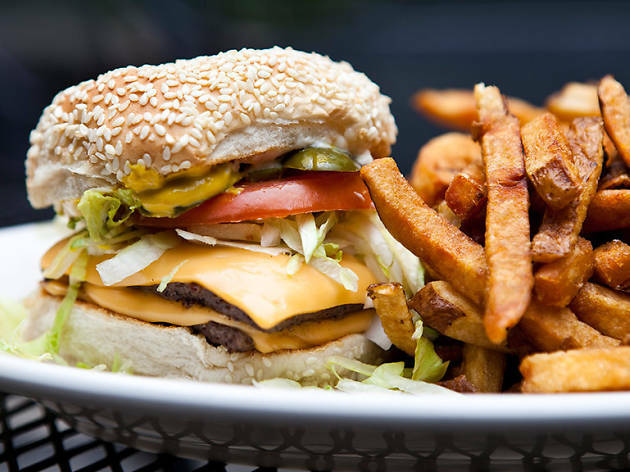 For 28 years, this jukebox-soundtracked Staten Island staple has served the same exact no-frills cheeseburger: a half-pound burger with American cheese on both sides, fired on the grill and wedged between two English muffins to soak up every last drop of meaty juice. 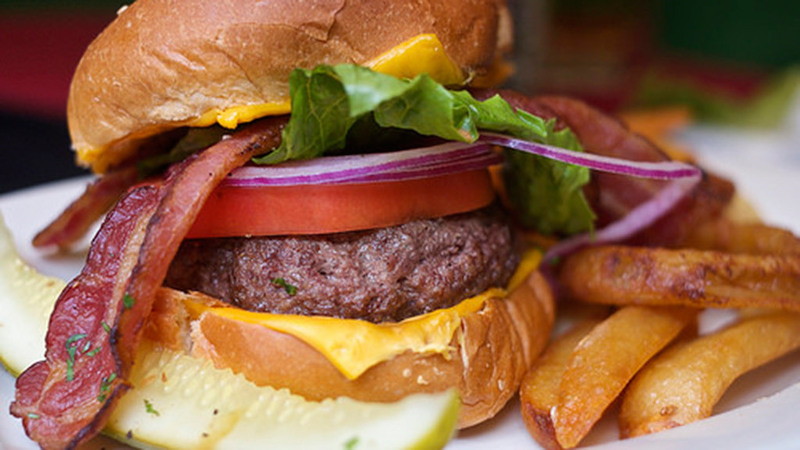 The clover-covered awning out front boasts STATEN ISLAND’S BEST BURGERS, and you’ll hear no objections from us. 650 Forest Ave, Staten Island (718-447-9276). $7.25. Korean fusion defines this ultramodern restaurant, where Far East burger riffs share menu space with japchae noodles and bibimbap rice bowls. Inspired by the sweet-and-savory marinades traditionally used in Korean barbecue (bulgogi translates to “fire meat”), an eight-ounce short rib round is splashed with soy, sugar, sesame and garlic before taking a trip to the grill. A topping of zesty kimchi slaw adds a layer of heat to the succulent patty. 957 Second Ave (212-308-8810, barkogi.com). $13. 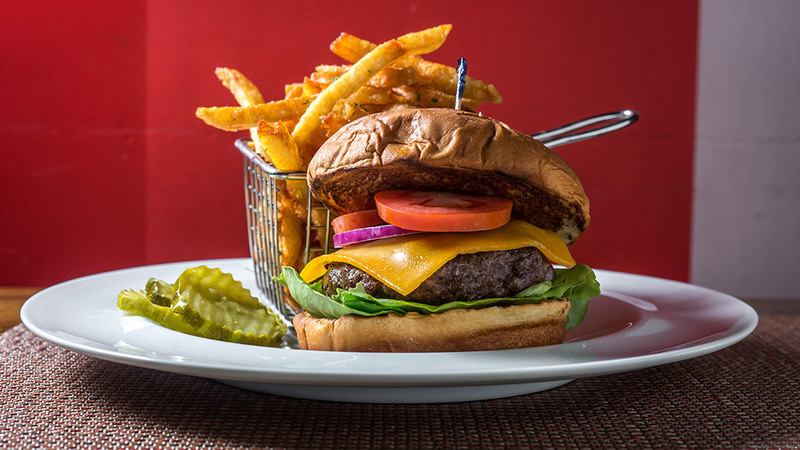 At the three locations of this Bay Ridge–based chain, choose from a mix-and-match menu of buns (brioche, potato roll, garlic bread), fromage (American, goat, Gouda) and half-pound patties of either lamb, turkey, tuna steak or beef. 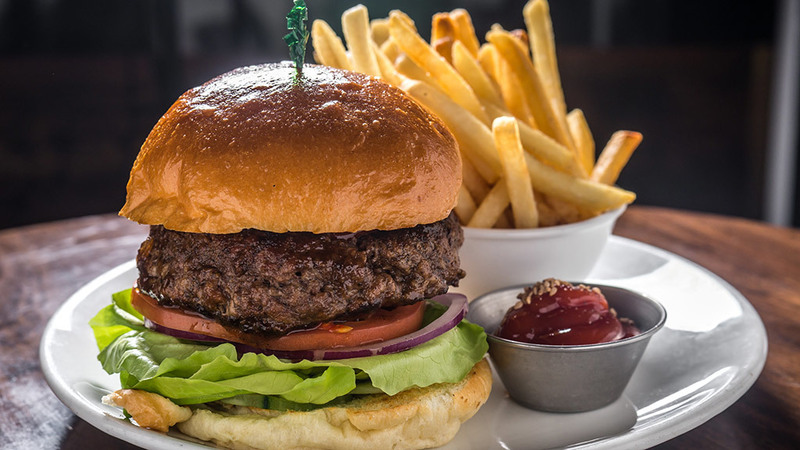 The last option is a crowd favorite, prepared in-house and doctored with a proprietary seasoning blend folded directly into the Black Angus ground chuck. 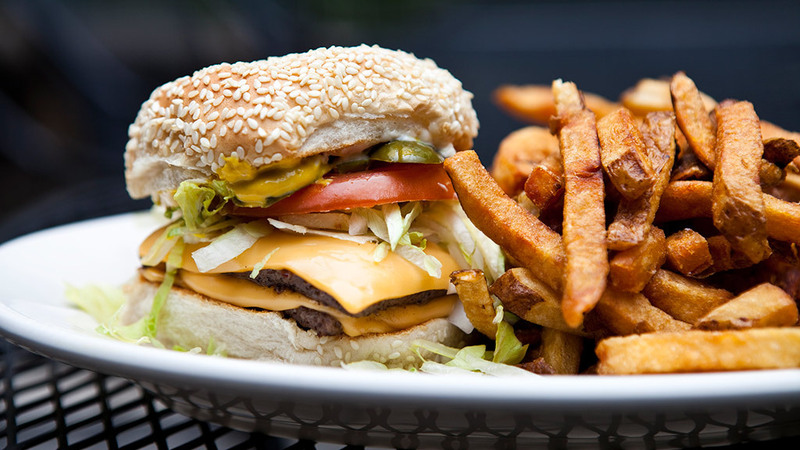 Various locations (theburgerbistro.com). $10.50. 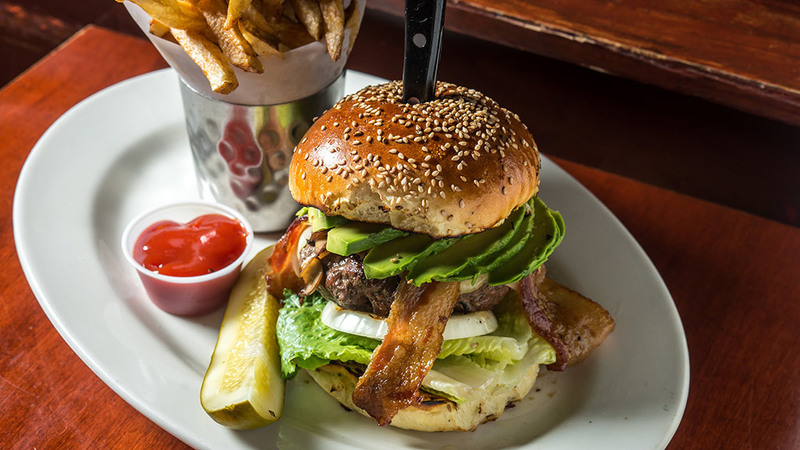 This beloved burger chainlet boasts a load of hand-pressed options—the English-muffin-bookended Fat Cat, for instance—but it’s the lower-profile house special that won over New Yorkers, with its six-ounce Pat LaFrieda blend flattop-griddled to a salt-crunch sear and topped traditionally with LTP (that’s lettuce, tomatoes and pickles, duh). Various locations (billsbarandburger.com). $9.50. 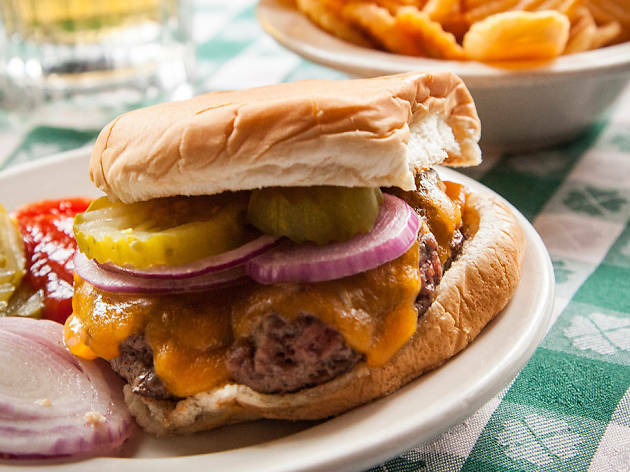 The recipe for this thin-pounded, multistacked burger traveled from co-owner Clay Mallow’s family grocery in south Dallas all the way to Park Slope. And thank goodness for that. 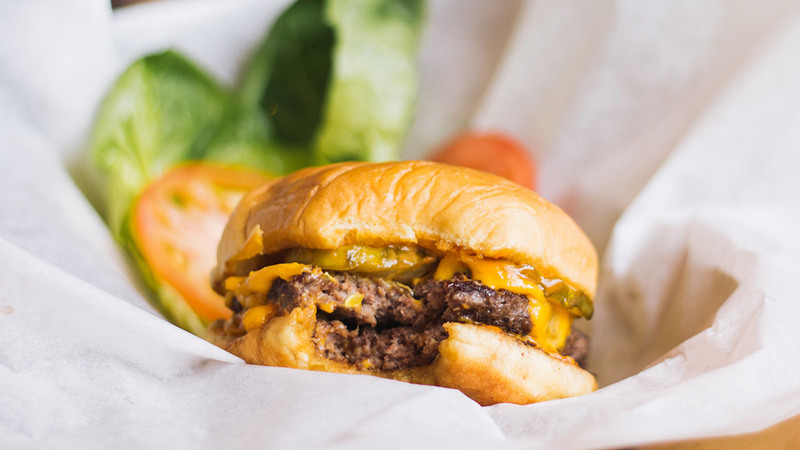 Squared-off, grease-grilled flattop patties (available only as a double or triple, with the latter costing a buck extra) are tricked out Big Mac–style with a mess of shredded lettuce, diced onion, dill pickles and American cheese on a generously seeded sesame bun. 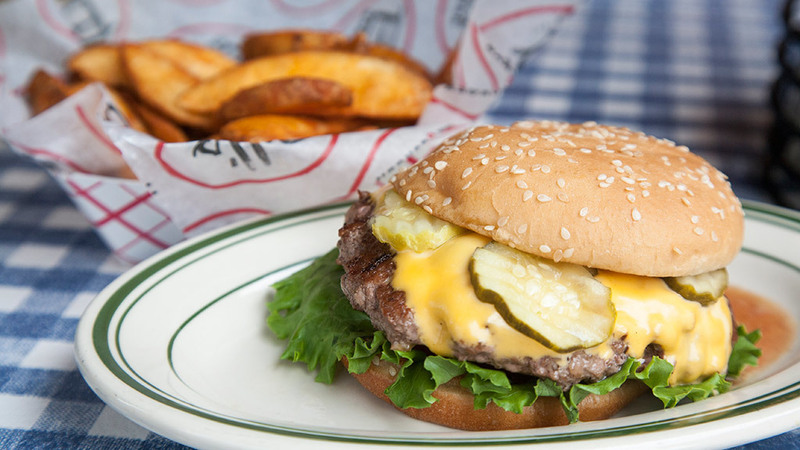 Squirts of yellow mustard and mayo (and not ketchup, partner) place the patty firmly in Texan territory. 339 Ninth St, Brooklyn (718-788-1444, dramshopbrooklyn.com). $13. 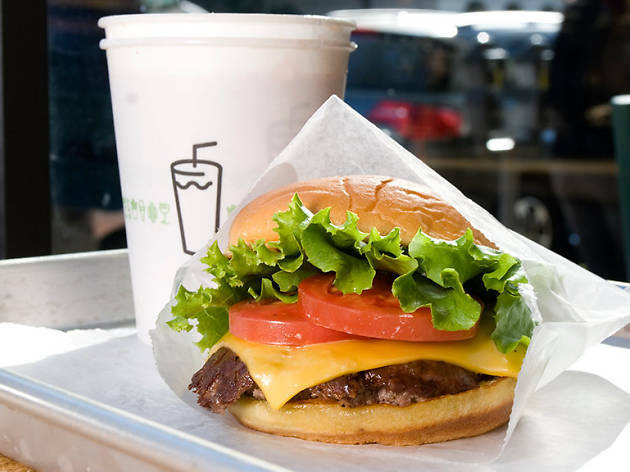 Crinkle-cut fries, ice-cold Concretes—no matter how crowd-pleasing the extras, the burger is what’s really been driving throngs to Danny Meyer’s pedigreed patty juggernaut for the past decade. The griddle-smashed number has become the quick-service gold standard, a decidedly New York spin on the West Coast burger, engineered with a custom LaFrieda blend (sirloin, chuck and brisket), neon-yellow American cheese and secret-recipe, mayo-based ShackSauce on a toasted Martin’s potato roll. 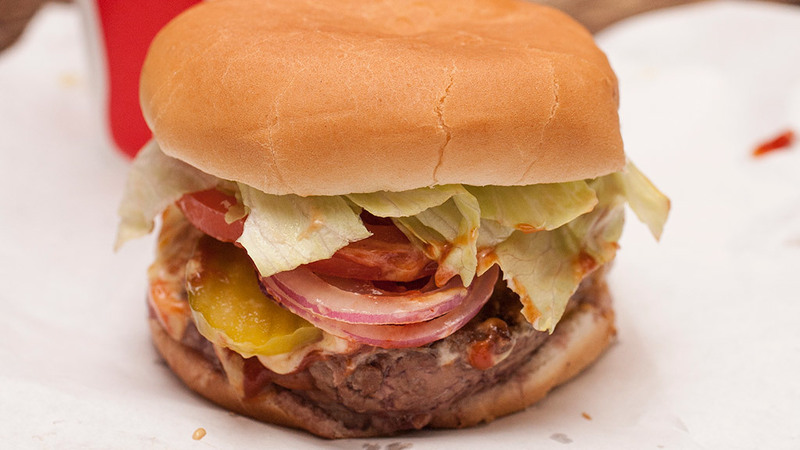 Sliced Roma tomatoes and green-leaf lettuce offer crisp contrast against the buttered bun and seared meat. 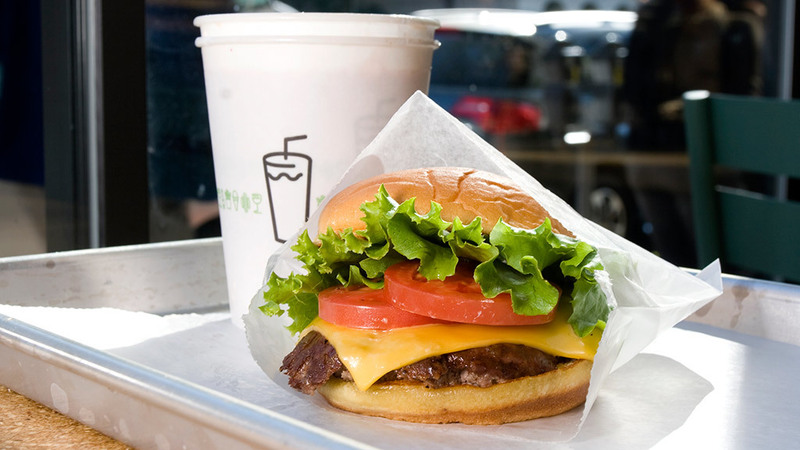 Various locations (shakeshack.com). Single $5.19, double $8. In 1966, Joe Donovan Jr. transformed a rundown gin mill called the Clover Leaf into this patty-flipping Woodside fixture, turning out jaw-testing burgers to neighborhood dwellers. 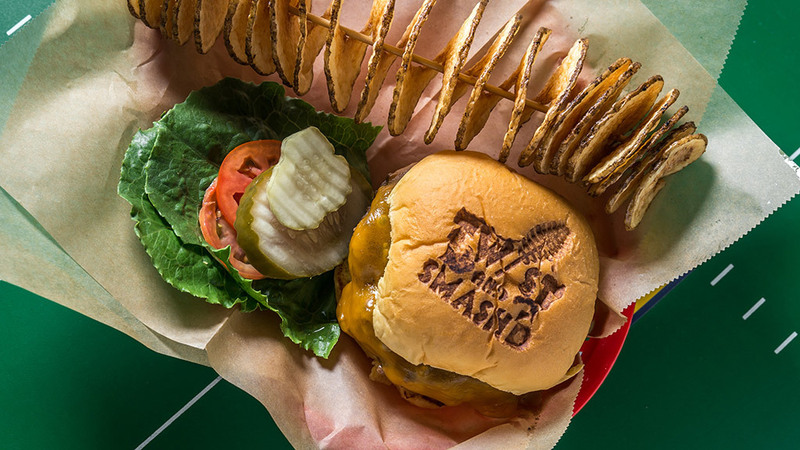 Ownership changed to longtime employee Jimmy Jacobson in 2013, but that no-fuss, ain’t-pretty-to-look-at beast of a burger graciously stayed the same, a loosely formed warhorse of coarse chuck and New York strip that’s broiled till rosy-pink on the inside and char-browned on the outside, then slapped with lettuce, tomato, cheese and optional raw onion. 57-24 Roosevelt Ave, Queens (donovansny.com). $10.95. 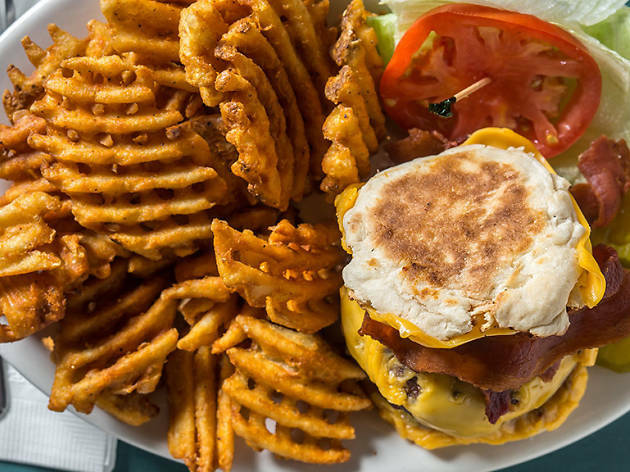 Named after the land now known as Tasmania, Van Diemens doles out wings and brews like any ole sports lounge, but its pitch-perfect house burger makes it a true destination. 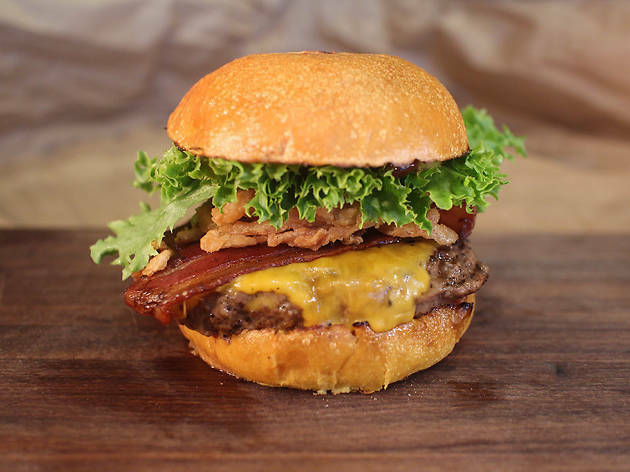 Hot off the grill, the Diemen is built with a gargantuan slab of Angus beef, a gooey coat of cheddar, sweet sautéed onions and a salty punch of bacon, all nestled between two warm brioche buns. 383 Third Ave (212-532-1123, vandiemensnyc.com). $14. This 85-year-old Prohibition-era speakeasy closely guards the secret ratios behind its custom Master Purveyors prime dry-aged blend, which includes chuck, brisket, short rib and a steakhouse-worthy, 28-day-aged porterhouse. 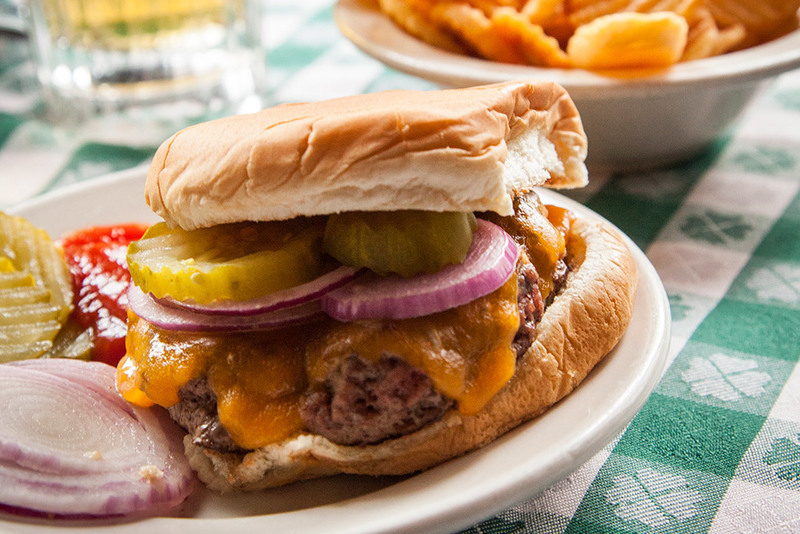 Each meaty, 10-ounce disk hits the heat with a slab of aged cheddar before landing on an Amy’s Bread challah roll. Slatherings of vinegar-infused ‘21’ sauce replace average-Joe ketchup here, joining ribbons of sautéed onions, tomato, lettuce and house-made pickles to crown the pricey-but-worth-it sammy. 21 W 52nd St (21club.com). $36. 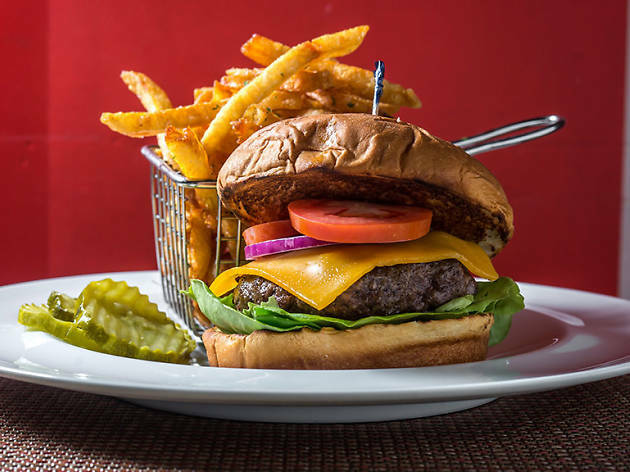 Forest Hills’ top burger slinger rolls locally sourced Angus ground chuck into fist-size meatballs, then flattens them on the griddle to gently sear both sides. (They’re smash’d, see?) Sandwiching the cheddar-coated pucks are soft, buttered Martin’s potato rolls, heated to a golden-brown crust and iron-branded with the store’s whimsical twisted-potato logo. 72-06 Austin St, Queens (718- 261-4527 twistandsmashd.com). Single $6, double $9.75. 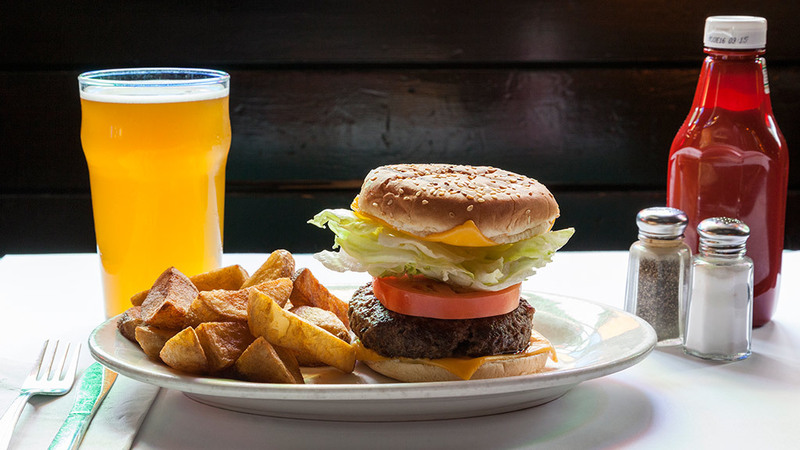 Simple pub fare at this divey watering hole, family owned and operated since 1936, has had but one responsibility in nearly 80 years: to soak up the booze. 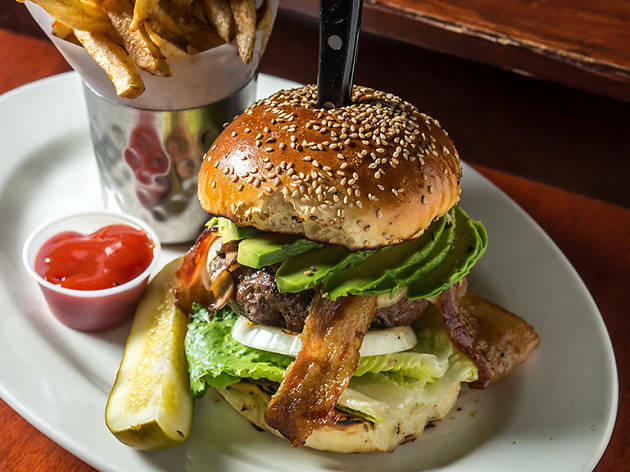 Yet the burger goes above and beyond the call of duty, with a plump, all-beef half pounder layered with tangles of crisp bacon, onion, bright tomato and a choice of cheese, from Muenster to mozzarella. 152 Seventh Ave (212-929-9691). $10.25. Who says that reality series are completely worthless? When Marcus Lemonis took the reins of this low-profile spot for CNBC’s The Profit in early 2015, the Staten Island joint had its Cinderella moment. Frozen patties upgraded to a three-way blend of freshly ground LaFrieda chuck, short rib and brisket, coated in a house mixture of cooking oils, then tossed on a flattop grill. 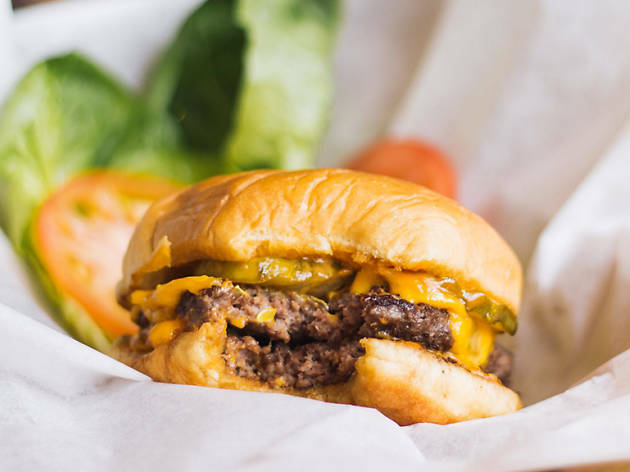 Even salt and pepper now get an upmarket twist here: Himalayan charcoal salt and coarsely ground butcher pepper add a kick to Hillside Farms American cheese, house-made sour pickles and red onion on a potato roll. 4115 Hylan Blvd, Staten Island (718-317-2333, standardburgers.com). $7. This unassuming, copper-fitted pub unexpectedly topped our list—with a whopping 4,500 votes—because of its humble ground chuck, dry-aged for three weeks and carefully seasoned with a secret, three-ingredient blend of spices. 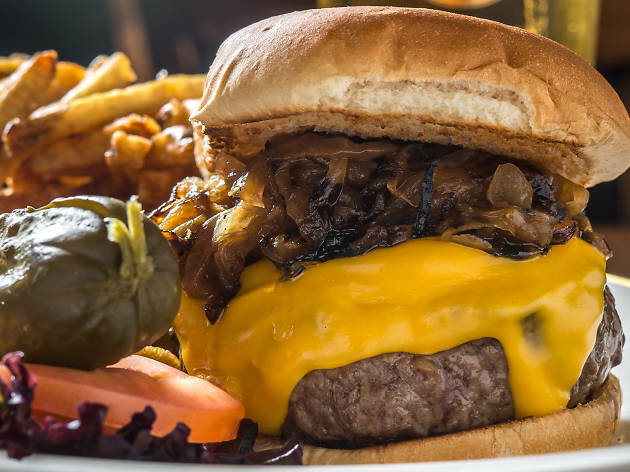 A cast-iron skillet burns a slight crust onto the edge of each savory patty, crowned with velvety American cheese and sweet, caramelized onions on a standard-issue bun. If there were ever a case for “simple is best,” this dark-horse candidate is it. 1055 Lexington Ave (212-396-3287, eatsonlex.com). $15.